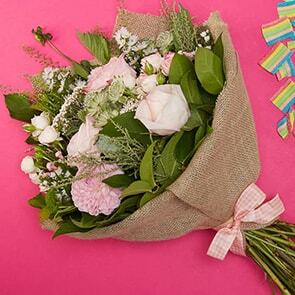 Send Spring Flowers anywhere in Ireland. A lively bouquet of spring flowers is just the thing to brighten someone’s day or bring the freshness of the season into your own home. At Bloom Magic, we specialise in creating luxurious bouquets that capture the essences of springtime, made with generously-layered premium fresh-cut blooms, and hand-tied into works of art. Our dedication to quality ensures that you’ll not only receive uncommonly wonderful service, but also that your bouquet will last a full week. Select our same-day flower delivery Dublin or next-day flower delivery Ireland to have a gorgeous arrangement crafted expressly for you and brought straight to the recipient’s door in perfect time for your event or occasion. Our catalogue hosts countless unique designs, exclusive to Bloom Magic. We work with the country’s top florists to create mindful arrangements that use minimal packaging, so the natural radiance of the blooms can take centre stage, and incorporate local blooms as much as possible, to ensure you always receive the freshest bouquet imaginable. Whether you’re looking for refined elegance or a touch of whimsy, you’re certain to find just the right bouquet in only a few clicks. Include a note with your personal sentiments, an attractive vase, or box of decadent chocolates to create a gift that’s truly one-of-a-kind. Because of our attention to detail, we’re able to extend a unconditional quality guarantee with absolute confidence that you’ll be delighted with the ordering process and your recipient will have a wonderfully memorable experience. We promise that your order will arrive exactly as planned in pristine condition and will last a full week upon receipt. Feel free to reach us via phone, email, or on-site instant messaging, or shop knowing you’re protected by the Bloom Magic Quality Guarantee now.